Schools – Two world-class elementary schools in the heart of Eastmark educate more than 1,000 students today. BASIS, one of the leading charter schools in the nation, operates their only Mesa campus at Eastmark and Sequoia Pathfinder Elementary focuses on STEM education for their students. Great Park – Here you can enjoy a monumental sense of freedom. Open fields give space to stretch, breathe, spread out and relax. Walking trails are the pathways to exploration, conversation and exercise. A lake and riparian stream bring in wildlife and magical moments with nature. Splash Pad – Kids can cool off and have some fun while parents can relax and socialize. The view from Palm Plaza isn’t bad either. Come see why Arizona Foothills Magazine named it one of The Valley’s Best Splash Pads! Orange Monster – Its a playground! It’s a sculpture! Its the Orange Monster! Designed by kids for kids, The Orange Monster delivers on their ideas for the ultimate urban playground: a fun spot to climb, crawl and imagine. Two tandem pipe sculptures connected with exercise and play netting, twist and turn up and down from the ground to over nine feet high for almost half an acre. 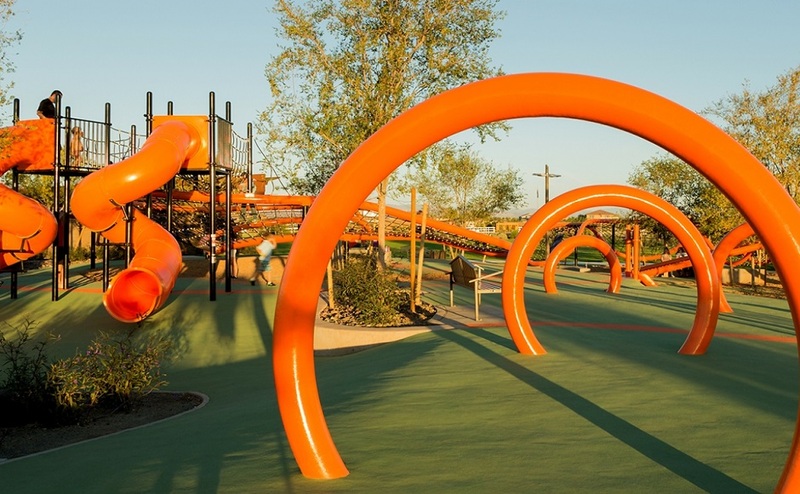 As if that wasn’t enough, The Orange Monster also includes fitness challenges for kids and adults, as well as swings, slides and play equipment. Event Pavilion – The Eastmark Event Pavilion is home to First Friday concerts. Bring blankets, low-back chairs, picnic baskets, and anything else you need for a fun, family-friendly evening under the Arizona sky.